Truly a house for all seasons. This 5,000 square foot elegant custom home (465 square meters) is approached via a three-quarter mile long (1,207 m.) aggregate driveway that winds through a park-like setting. As you emerge through the tall pine trees, the initial view of the house atop a commanding knoll presents a beautiful introduction to the viewer. Always an impressive site when returning home. The exterior of the home is of traditional solid stucco. This superior technique and material affords an almost maintenance-free, fireproof and impervious outer protection for the structure. Top quality construction was overseen by the current (original) owner on a daily basis. Upon advancing closer one sees the front (South side) of the house is almost completely glass. These Anderson doors and windows are of superior quality and add to the energy efficiency (more on that later). The home is 120 feet long (36.6 m.) and is on an East/West axis to the sun for maximum, energy-saving, passive solar exposure in the winter. The structure is comprised of two forty foot (12.3 m.) wings on either side of a forty foot square central core. Inside this central core is an ‘open to the sky’ exquisite Asian garden and refuge. As one continues toward the house, the driveway gives the visitor two choices: 1. an incline ramp leads to the front of the house and loops under the mature maple trees for convenient, no steps, access to the primary living areas. Or, if you proceed on the main driveway, you will briefly enter a small forest grove which then opens onto the rear of the house, the main parking area and garage, and the ‘second’ main entrance. A low, curved, Asian style roof and semi-circular stone entryway and American black walnut door welcomes from this approach and sets the tone for what awaits inside. 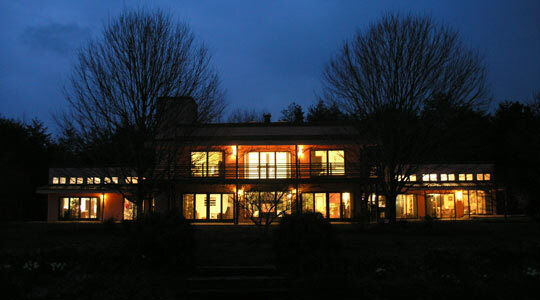 The long leisurely driveway passes by the lake and has beautiful views of hillsides, pastures and wooded areas. The approach at once relaxes the viewer and builds a sense of anticipation of arrival. 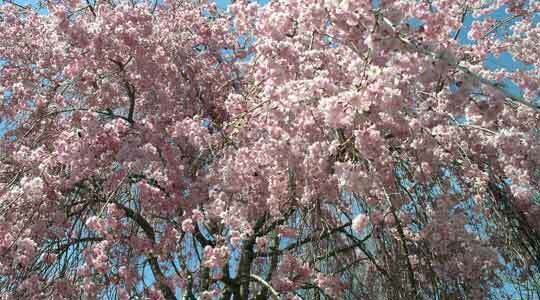 Year round there is a flowering plant of one sort or another to greet you along the way. Some of the wild varieties can be quite exotic. The nearly all glass front creates numerous advantages in design: easy access from anywhere in the front lawn, finely controllable ventilation, economical heat gain in the winter and, certainly not lastly, spectacular views from practically every area of the home. All exterior walls incorporate 2x6 lumber for added insulation capability. 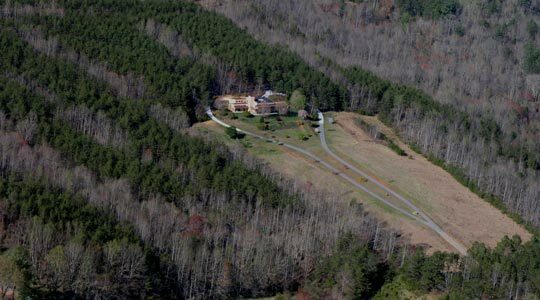 Views from the house range from relatively close views of beautiful pines and hardwoods close to the home, to more long-range panoramic views of the approximately 20 acre (8.1 hectare) boulevard and pasture area that comprise the front lawn. These views are especially appealing as seen from the balcony. The foliage around the immediate perimeter of the home is nothing short of spectacular. All mature landscaping includes wild and hybrid azaleas, wild mountain laurel and rhododendron as well as 35 Japanese maples in various colors. These trees are second generation plantings from the original Fredrick Law Olmstead trees at the famous Biltmore House in Asheville, NC. The current color selection of the exterior is based on a small plant found just a short distance from the house. 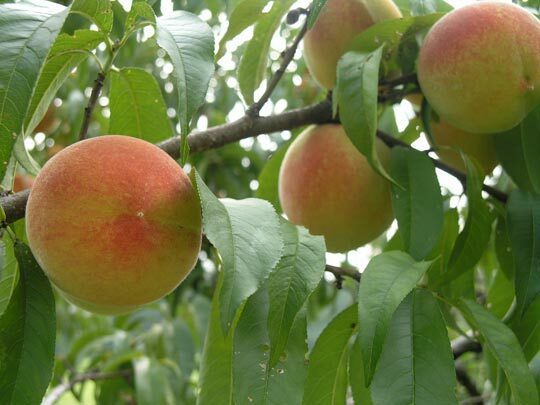 Mature fruit trees in the orchard include apples (3 varieties), peach, apricot, cherry (2 varieties), and pear (3 varieties), fig, and hazelnut. All fruit from these trees is organic; no chemicals have ever been used on them. The fresh peach deserts this year were a gourmet delight, as were the frozen drinks. Preserving these treats make excellent, and always welcome, very personalized gifts. 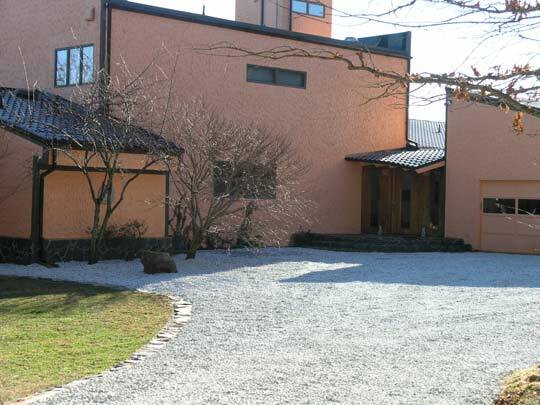 The end of the driveway brings one through the small forested buffer area and to the main entrance of the home. Asia influence blends seamlessly with the classic feel of a comfortable Tuscan villa. Details in this area include illuminated sculpture, stone skirting, large quartz ‘Zen’ stones, bamboo, and the American black walnut hand-crafted main door and side lights. Designer-created surprises around every turn. 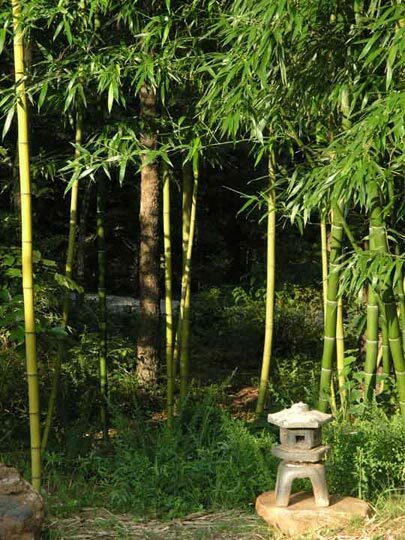 A stone lantern beckons to a path through a bamboo grove and into the forest.